Why Aren’t There Great Chinese Restaurants in New York? I was commissioned recently to write an article detailing my choices for the 10 Best Chinese Restaurants in the United States, when I quickly realized I had a problem. No, it wasn’t that I felt unqualified to draft such a list, since I have eaten at thousands of Chinese restaurants in Los Angeles and San Francisco, hundreds of Chinese restaurants in New York City, and a representative sampling of the best Chinese restaurants in Chicago, Boston, Houston, Philadelphia, Washington D.C., Atlanta, Honolulu, Dallas, and any other city having a decent sized Chinese community. The problem was that when I compiled my list, all 10 restaurants were in California — seven in Los Angeles and three in San Francisco, which didn’t look like the national list it was supposed to be. The article ran anyway, with the editor spinning the title to ask if all of the best Chinese restaurants were in California. The response was immediate: Californians, particularly those who were familiar with New York Chinese food, in complete agreement, while many New Yorkers gave me the Bronx cheer and accused me of being biased towards my hometown food. That accusation is easily countered by the fact that if I were to do a 10 Best list for Chinese food in North America, all my choices would come from Canada, either Vancouver or Toronto, and none would come from California. 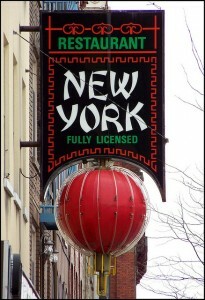 Note that many New Yorkers who had actually eaten the Chinese food in Los Angeles and San Francisco agree on California’s superiority, with most New York naysayers admitting they had not eaten in the San Gabriel Valley in suburban Los Angeles, home to the best Chinese food in California (and the country). A prominent food blogger for one of New York City’s newspapers referred to New York Chinese food as “crappy” compared to Los Angeles. So I believe the premise that New York clearly trails Los Angeles and San Francisco in the quality of Chinese food is a reasonable one. So what is the reason for this gulf between California and New York Chinese food? After all, New York Chinese food did surpass San Francisco as America’s Chinese food mecca back in the mid-1980s, while we in Los Angeles would actually talk about specific Chinese restaurants we would like to try in New York. And the Chinese population in the New York area is comparable to, if not larger than, the Chinese populations in Los Angeles or San Francisco, so community size doesn’t seem to be the difference. The real reason for the chasm between New York and California Chinese food is demographics. I have often said that New York Chinese food is stuck in the 1990s. Make no mistake — 1990s Chinese food was very good and there are many, many very good Chinese restaurants today in Flushing, Manhattan, and Brooklyn. But Chinese food has evolved significantly in the past decade and that evolution has largely bypassed New York. One major demographic difference can be seen in comparing the Chinese populations in New York and Los Angeles. As first brought to my attention in a Business Week article two decades ago and reinforced by a book and New York Times articles written by Jennifer 8 Lee, Chinese immigration to New York for over two decades has in large part originated from Fujian province. The Fujianese are largely working-class people, and many of them are undocumented. Check out Manhattan’s Chinatown, particularly the portion off East Broadway, and you can see this densely packed area is largely minimum wage territory. Obviously, the entire New York Chinese community isn’t working-class, but there is a heavier weighting in that direction. In contrast, the Chinese population in Los Angeles skews more to the upper-middle class. Not to say there aren’t working class Chinese here, and indeed there are plenty. But there hasn’t been the large working-class immigration from China to California like there has been in New York. (There are virtually no Fujianese immigrants here). Rather, for over 30 years the San Gabriel Valley near Los Angeles has been marketed in Asia as the “Chinese Beverly Hills.” Wealthy Chinese investors would buy houses in the San Gabriel Valley and send their families to reside while themselves continuing to live abroad. Meanwhile, a heavily professional technical upper-middle class Chinese community has spread across the San Gabriel Valley. Indeed the economic strength of the Chinese community is shown by the fact that there has been little residential real estate price erosion here during the great recession, and prices in the most expensive San Gabriel Valley city of San Marino are at historic highs. This is a community that demands and can afford the best Chinese food. Furthermore, the San Gabriel Valley has spawned what the press has dubbed the “626 Generation”, referring to the San Gabriel Valley’s telephone area code. These are the upper-middle class twenty- and thirtysomething Asians who have developed a food-centric culture. For this generation weaned on the Food Network, good eating is king. They dine out a dozen or more times a week in local Chinese restaurants, and then head to the local boba shop for drinks and dessert. One other demographic factor distinguishes California Chinese food from New York. If one takes what are often considered to be the best Chinese food centers in North America — Vancouver, Toronto, Los Angeles and San Francisco — and compares them to New York, there is one stark reality. The Chinese food in all four of these cities has a heavy Hong Kong influence, while New York does not. Chinese food continues to evolve and improve, and a major hotbed of this evolution is Hong Kong. While eating in Hong Kong knocks the pants off any Chinese food on this continent, there is enough of a presence to continually raise the bar in these Canadian and California Chinese communities. David R. Chan is a third-generation American who has eaten at 6,090 Chinese restaurants and counting. He maintains a spreadsheet of each of his culinary conquests — a document he began in the early 90s, when he bought his first home computer. “When I entered the workforce in the 1970s, that coincided with the rise of what we think of as authentic Chinese food in North America,” Chan told the LA Weekly Squid Ink blog. “As such, my goal was to try every authentic Chinese restaurant in the Los Angeles area at least once.” He has extended his list to New York, San Francisco, and thousands of restaurants beyond. Still, Chan admits, he can’t use chopsticks.